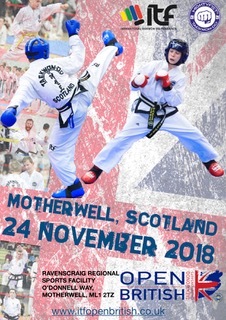 It is with great pleasure that you and your students are invited to the 2018 ITF Open British Championships which this year will be held on Saturday 24th November 2018 at Ravenscraig Regional Sports Facility, O’Donnell Way, Motherwell, ML1 2TZ, Scotland. The competition is open to all ITF Taekwon-Do students 10th Kup to 6th Degree and will run according to ITF Rules & Regulations. Competitors must wear ITF Dobok and ITF Belt. Additionally, the electronic scoring system and large screens will be used to bring a professional approach to the event. Competitors must compete in the age category according to their date of birth. We look forward to meeting and welcoming you to Motherwell this November.